Results for the Sport Air Racing League (SARL) are being shared by Bruce Hammer. Hammer, who placed second in the FX Blue category, is sharing his story and the 2016 results with SkyOx, one of his valued sponsors. The SARL racing season has ended and it was another great year for me. My work schedule did not allows me to participate in as many races and I would have liked. However we did come in with the second-place trophy in the FX Blue category. 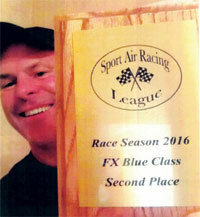 I could not have lost to a better pilot – my brother Steve, who earned the overall points score in the FX Blue category. Steve is a great champion to have at these races, says Bruce. NOTE: Hammer will have his SkyOx Portable Oxygen System close at hand. Click here for the season results including the Rocket 100 Race. An announcement was made this week that AirCraft Industries Inc. (DBA SkyOx) will change ownership effective December 1¸ 2013. The company is a leading manufacturer and marketer of portable oxygen systems for general aviation pilots and passengers. In addition they offer a line of windsocks and windsock frames. Walt Smiles, chairman of the board for, and current owner of, SkyOx; said that the business is being acquired by Susan Klemm, current president of the company. Klemm also serves as president of Christianson Industries, a sister company of SkyOx. SkyOx offers nine models of portable oxygen systems with capacities ranging from two-cubic feet to 50-cubic feet of oxygen. The larger capacity units are constructed of steel. The smaller units, from two cubic feet to 24-cubic feet, are constructed of aluminum. All systems are equipped with a two-port or 4-port regulator and an easier to read top mounted, flow adjustment control. The design features quick-disconnect ports for either cannula or masks.